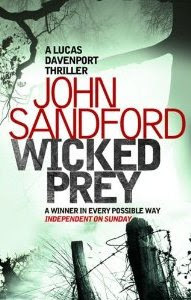 Wicked Prey by John Sandford is book # 19 in the Lucas Davenport series, which I can truthfully say is a very well established series. The books in the series, of which I have read all, is generally of a high quality, but in my opinion some of the books have a much stronger storyline than others. This one is a fast paced and great read for those of you who like a good thriller. It is not necessary to have read all the previous 18 books to enjoy this one, although it will help a bit with the characters. Wicked Prey have two plots; one about a ruthless group of robbers doing heists and not caring if the kill people to reach their goal and another concerning a wheelchair bound psychopath and Lucas Davenport’s 14 year old soon-to-be-adopted daughter All takes place during som hectic days while a political convention is going on in the city. The two plots does not really have anything to do with each other, except that they cross each others lines from time to time, something the characters are not even aware of. Its well written and perfect for a great beach read. I liked it, I was entertained and I read it fast, but it is not earth shattering great. I think you sum up this series perfectly: you enjoy it when you read one, but you can also live without them. I have been interested in this series. Between you and Dorte, I'm still planning on reading them, but I won't make them a priority. I think the series has lost a little bit of oomph in the last several installments, but I still love Lucas and just started the latest, Storm Prey.